Our mission at Japanese tea ceremony Kyūgetsu in Kyoto is to make the rite of tea accessible, comprehensible and enjoyable to you. 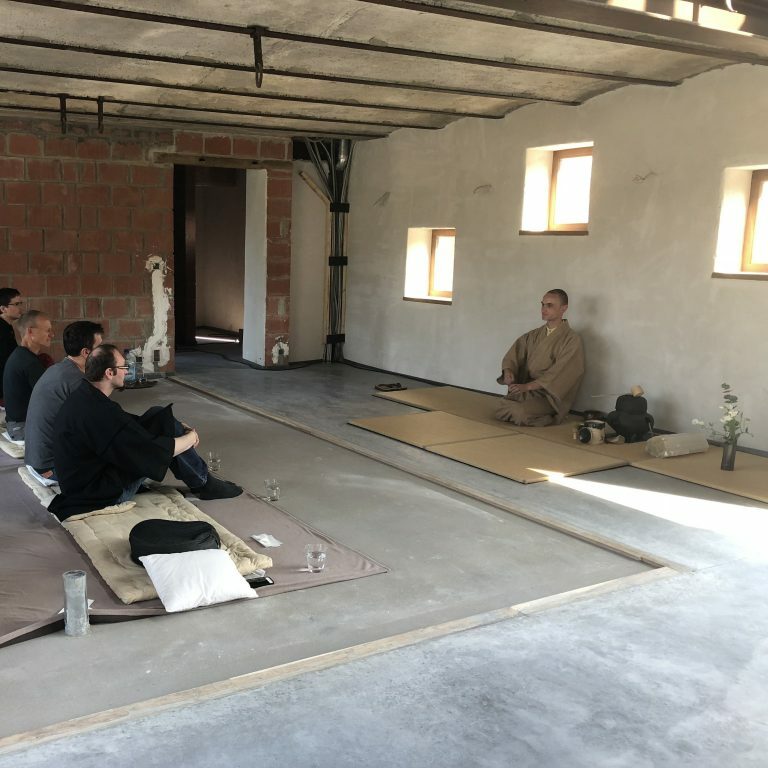 We wish to make the Japanese tea ceremony available in Kyoto to outsiders of Japanese culture, through breaking with social conventions and language barriers. To participate in a tea occasion elsewhere you will be expected to have had prior training in the art. We don't expect you to be acquainted with the art, but instead will guide you through the proper procedures in due course. What your Japanese host will likely fail to provide, we skilfully augment at our Japanese tea ceremony in Kyoto. You as foreigner lack pre-notion of certain distinctly Japanese cultural traits that the locals take for granted. We know that prior explanation of such notions is necessary for you to begin understanding what the Japanese tea ceremony is about. Participation in a tea occasion doesn't need to be a stoic and painful endeavour. If you're not comfortable sitting on your knees, we'll allow you to sit cross-legged or provide you with a chair. While the tea ceremony does entertain a meditative aspect, there is no need to agonise yourself for the duration of the event. Please come; and let us together share serious fun. 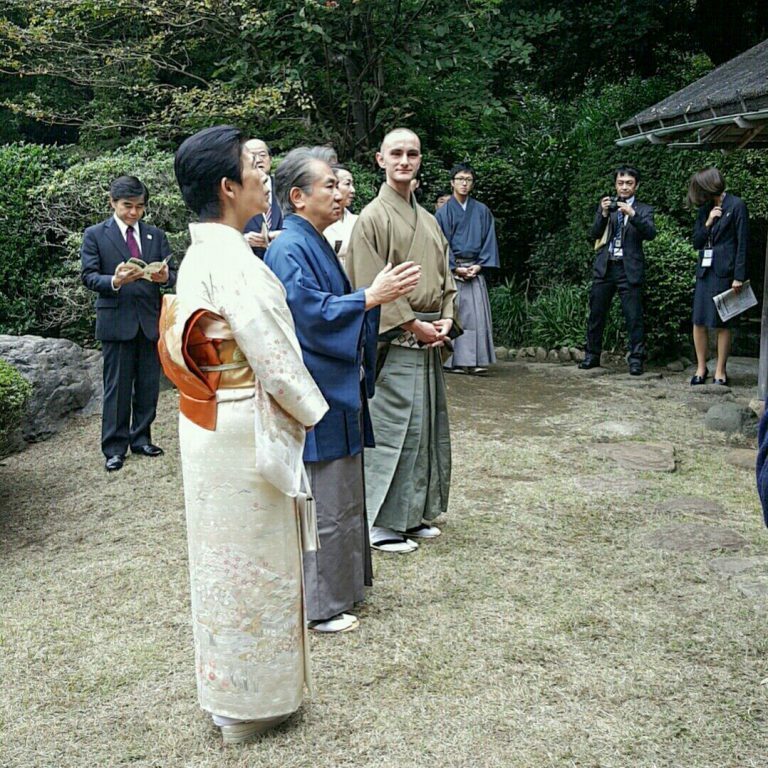 In sharing with foreign visitors to Kyoto our understanding of this unique form of hospitality known as Japanese tea ceremony, our goal extends beyond increasing worldwide appreciation of this rite, and indeed of traditional Japanese culture as a whole. For we believe that engagement with Tea is engagement with the wisdom of our forebears, doing which can be of invaluable assistance in resetting the paradigms through which we see the world, and in effect help make this world a better place. Kyoto is Japan’s cultural center. The city is rich in historic places to visit, traditional arts and crafts to appreciate, and venerable cultural practices to experience. All, however, that is for the most part accessible to the visitor are brief, surface glimpses of what lies hidden underneath. As masters and devoted teachers of the Japanese tea ceremony, we make it our first concern to provide for our visitors and students an authentic engagement with this art. Instead of limiting them to mere outsider spectatorship, we strongly believe that whoever has chosen to visit the cultural capital of Japan, Kyoto, should at least receive informed guidance in engaging fully with one of the traditional practices available in this city. At Tea Ceremony Kyūgetsu it is our mission to make the rite of tea accessible, comprehensible and enjoyable for whoever chooses to visit us. This we do not only through offering an elegantly-expert service of tea, but also by bringing our guests to discover, through full immersion-participation, the spiritual and emotional effects afforded by such a service, helped by detailed explanations in competent English. In sharing with foreign visitors our understanding of this unique form of hospitality, our goal extends beyond increasing worldwide appreciation of this rite, and indeed of traditional Japanese culture as a whole. For we believe that engagement with Tea is engagement with the wisdom of our forebears, doing which can be of invaluable assistance in resetting the paradigms through which we see the world, and in effect help make this world a better place. Discover what the Tea ceremony in essence is, during an exclusive service of “real tea” – thick tea. 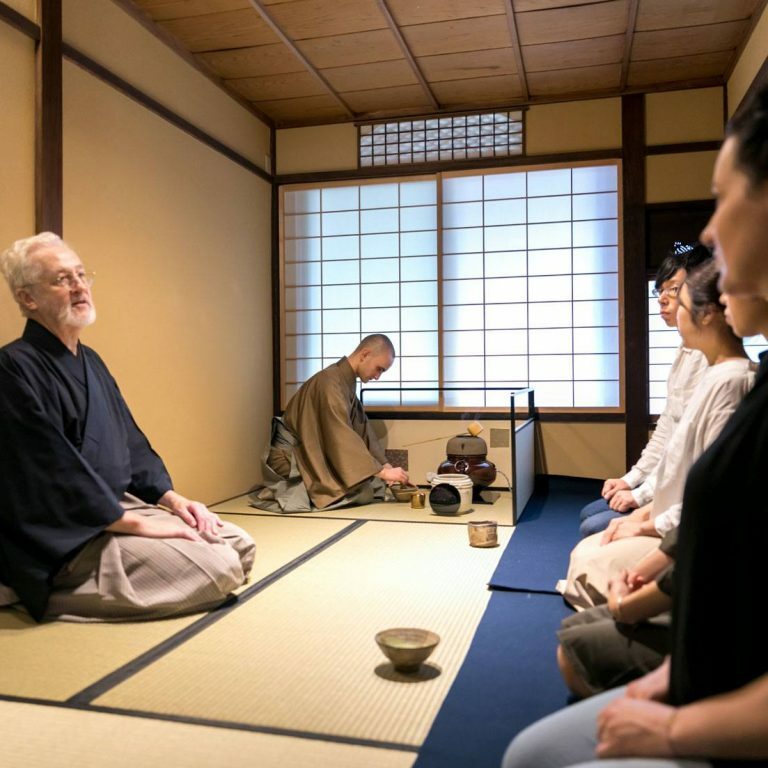 Receive personalized guidance and instruction provided by two fully-accredited Masters of the Japanese tea ceremony in Kyoto. And, simultaneously deepen your understanding of traditional Japanese culture as a whole. Detailed explanations and guidance in English. 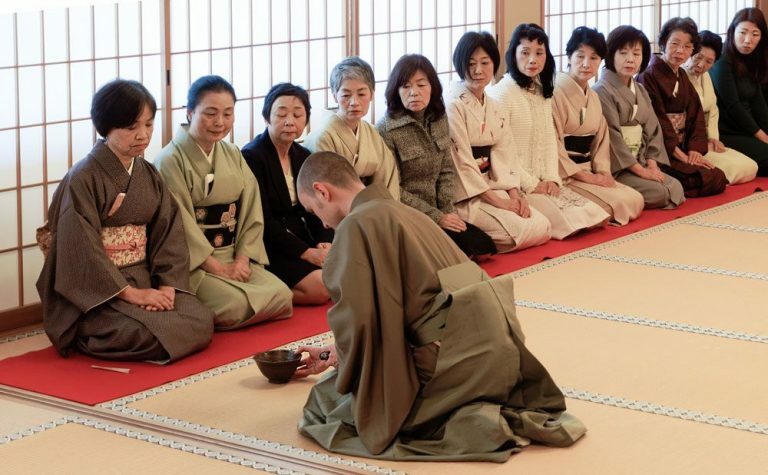 Our tea ceremony activities in Kyoto are aimed at making this tradition and culture accessible and understandable to foreign visitors. While most of our tea ceremony activities are hosted at our traditional tea hermitage at Meikakuji, we also provide experiences and introductory sessions at, for example, a location of your choosing. Tyas Sōsen and Stephen Sōshun often serve at large national scale tea gatherings, entertaining over 400 guests in a single day. At such tea gatherings, tea practitioners from all over Japan attend to enjoy a sight of an Enshū school service, while savoring a bowl of tea. The yearly Shukō chakai, hosted in Nara in February is one such example. When foreign visitors come to Japan, language is often a large barrier, especially when it comes to conveying the intricacies and nuances of culture. Understanding both Japan’s tradition and Western culture, Tyas Sōsen and Stephen Sōshun strive to make Japan’s heritage understandable in common English language. Tyas Sōsen often travels outside of Japan to host tea ceremony demonstrations, tea tastings and related activities that provide insight in Japan’s intriguing tea culture.